Jantar Mantar is also known as Astronomical Observatory which is used to observe the positions of extraterrestrial bodies and calculate the local time. Large numbers of tourists visit this place for sightseeing and architects, mathematicians, historians and geographers also visit Jantar Mantar for analysis and observation. The five observatories of India were built by Maharaja Sawai Jai Singh II and that of Jaipur is the largest of all. The one in Mathura had been almost damaged badly. Maharaja Sawai Jai Singh II also founded the pink city, Jaipur. He was an expert in polity as well as in mathematics, physics and astronomy. During his rule, he rectified the astronomical calculations used in Islamic zij tables for Muhammad Shah, emperor. He performed this task by gathering and studying the astronomical data from Persian and European nations. After the research and study, Sawai Jai Singh II built instruments by stone to identify the astronomical position of planetary bodies and calculate their time. In Jaipur, the construction of Jantar Mantar was started in 1728 and ends in 1734. It was believed that instruments were showing most accurate results. Jantar Mantar remains open from 9:00 am to 4:30 pm for 7 days in a week but the best time is noontime when sun is vertically above so it is simple to interpret the reading and understand the process of each instrument. Generally, it takes 30 to 45 minutes duration to explore the whole attraction. Students would require their ID proof to avail the discount. 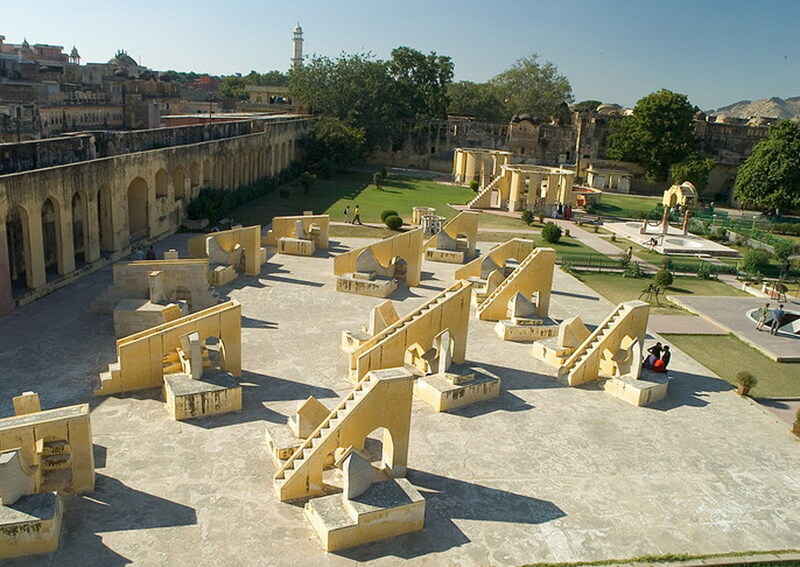 There are 19 instruments in the Jantar Mantar, Jaipur for measuring astronomical positions and distances of celestial bodies. These instruments are made by stones in various geometrical shapes. The best way to explore Jantar Mantar is to hire a guide to get a deep insight of Jantar Mantar so that you can understand how these instruments work and get you results. The instruments are named as, Chakra Yantra, Dakshin Bhitti Yantra, Digamsha Yantra, Disha Yantra, Dhruva Darshak Pattika, Jai Prakash Yantra, Kapali Yantra, Kanali Yantra, Kranti Vritta Yantra, Laghu Samrat Yantra, Misra Yantra, Nadi Valaya, Palbha Yantra, Rama Yantra, Rashi Valaya Yantra, Shastansh Yantra, Unnatasha Yantra, Vrihat Samrat Yantra and Yantra Raj Yantra. Jantar Mantar is located in the heart of the pink city so when you explore Jantar Mantar, you can avail an opportunity to explore few other prominent historical monuments such as, Hawa Mahal, City Palace, Triplolia Gate, Goverdhan Temple and Govind Dev ji Temple. Apart from exploring ancient monuments, shopaholics can also enjoy the shopping in the walled city. Areas like Johari Bazaar, Bapu Bazaar, Nehru Bazaar, Tripolia Bazaar etc. are popular for handicrafts, lac bangles, blue pottery, mojdis, puppets, gems stones, silver ornaments and so on. If you have not explored Jantar Mantar in Jaipur yet then include it in your Golden Triangle Tour itinerary and have an exotic trip.